Obituary for Ann Jean Biondo | Bronson & Guthlein Funeral Home, Inc.
Ann Jean Biondo of Milltown, NJ passed away surrounded by her loving family August 24, 2018 at St. Peters University Hospital. She was 93 years old. Ann was born and resided in Ravenna, OH until her marriage in 1955. 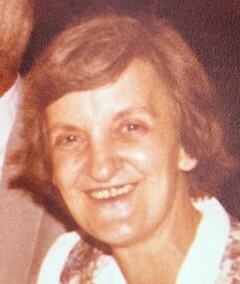 She was a resident of Milltown for 58 years. She was a faithful parishioner of Our Lady of Lourdes RC Church. Ann’s purpose and joy in life was her family. She put her considerable cooking skills to use weekly in the meals she lovingly prepared for them. She also enjoyed tending to her roses, knitting, and reading. Predeceased by her beloved husband of 63 years Biogio Biondo in May, Ann is survived by her loving daughter Vitina Biondo, son Paul Biondo, daughter Frances Biondo, grandchildren: Christina Biondo, Anthony Biondo, AnnMarie Goff, Angelina Goff, and Daniel DiTaranto, great-grandchildren: Benjamin, Isabella, and Olivia, and sister Frances Hickey. Ann’s family will welcome friends Monday 2-4 & 6-8pm at the Bronson & Guthlein Funeral Home of Milltown. The funeral service will be celebrated Tuesday, 10am at the funeral home followed by entombment at Franklin Memorial Park.